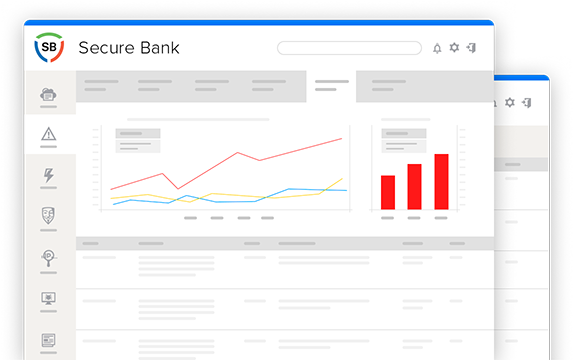 Get a clear understanding of relationships between accounts and other entities to discover suspicious funds transactions. Detect the usage of stolen account credentials with advanced user behaviour analytics and device fingerprinting. Secure your electronic payment environment and protect user’s credit card information. Catch banking trojans with patented clientless malware detection technology. Defend against online scams and prevent data leakage with global user profiling and threat intelligence stack. Protect users across web and mobile channels, including e-commerce and other third-party platforms. Unlike traditional anti-fraud that analyses transactions, Secure Bank algorithms start working right from sign-in step to detect dangerous activities before the fraud is executed. Combining several technologies Secure Bank is more than the sum of its parts — it speeds up detection and enhances accuracy while giving context for response and investigation. All scripts, traffic and data is encrypted to avoid interception by third parties. We do not collect and process personal data and other confidential information. All the infrastructure could be deployed at customer site. Dedicated Group-IB anti-fraud analyst and incident response capabilities backed up by a team of world-class forensics experts and leading Threat Intelligence Platform recognized by Gartner, IDC and Forrester. Zero client requirements for installation. Already integrated with leading anti-fraud systems such as: RSA, SAS, Intellinx, GBG Predator. Web interface to get detailed reports and rich context on detected threats, create graphics and analyze fraud dynamics. Secure Bank functionality might be customized and adjusted to focus on your high priority issues with ability to create rules fitting your company risk tolerance. CJSC Sberbank of Russia, expresses sincere thanks to Group‑IB for assistance in preventing theft from the "Sberbank Online" and "Sberbank Business" banking platforms using Secure Bank.